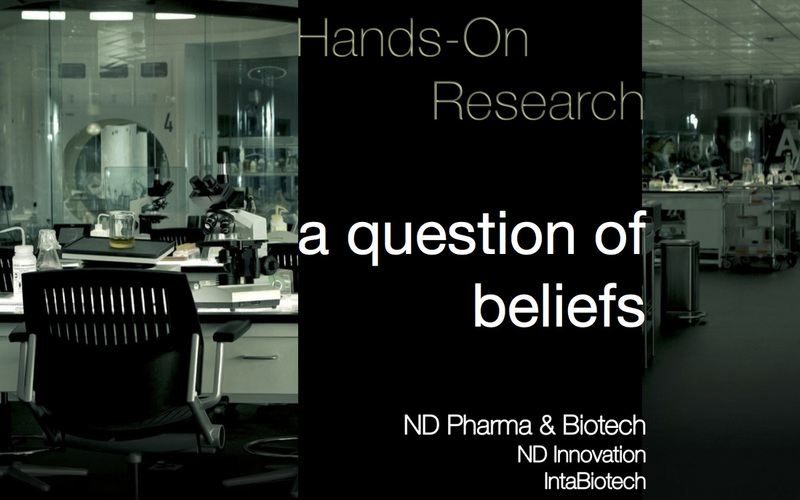 ND Pharma & Biotech is an European Biopharmaceutical, Biotechnology and Global Chemical Company focused on developing and commercialization of technologies and products with applications in diverse fields, from therapy to the food industry, with emphasis on the use of products and organic elements and the production of less toxic and dangerous to provide multiple solutions to emerging problems in the industrialized world today, from the massive overuse of toxic components - chemicals that pose a serious risk threatening our health and our lives. So we operate in a multiplicity of sectors and fields from Healthcare and Life Sciences, Food & Nutrition, Veterinary, Chemicals, Research, Development and Innovation, Discovery, Custom Solutions, Industrial Field, Energy, Gas and Oil, and many others thru a complete and ever-growing network or partners and associates within the different fields, CRO´s, CMO´s, Industrial, Commercial and Marketing Development partners. However, we explore constantly new areas in order to identify opportunities, as it can be, new technologies, stem cell therapy and many other, including but not limited to those exposed. The strategy of replacement drugs ("drug reprofiling" or "drug repositioning") is based on the search for new therapeutic indications for existing drugs. The investigation of drugs already approved for human use (phase II onwards), doing necessary steps of increased risk of developing (pre-clinical and phase I) which represent the main cause of failure of drug development. About 50% of the indications of marketed drugs today are for new applications (new indications) of these drugs originally approved for the treatment of other diseases.These discoveries have traditionally done by accident or by specific research on a particular drug. - Non-therapeutic use Proteins (food, cosmetic and industrial use). - Intermediate products: GMP culture media and biomaterials (scaffolds or matrices). Our research is distributed among the various conventions and agreements signed with universities and research centers with which we have agreements, and where research is carried out under our sponsorship, sponsorships and licensing, especially in the field of developing new drugs, biosimilars, therapy cell, regenerative medicine, tissue engineering, etc..
references for basic drug discovery and applied research. We support emerging and well-established companies and companies and innovation centres in the pursuit of novel therapeutics at all the involved stages from commercial supply to manufacturing placing our expertise and technology to customer´s service to reach top quality products. To add value to our customer´s products and formulas is at the core of our Food & Nutrition Division. We include Food, Feed, and Health (Special Hospital Nutrition), and many other sectors of the Division within the scope of this important area for us. We offer quality of service and support to industry and industrial sectors through this important division in the areas of quality management, regulation, compliance and development, all basic pillar of the industrial progress and success, in a variety of sectors, fields and applications. Our offer of chemicals, API´s and other molecular solutions is based on experience, trust, quality and reliable sourcing of materials. We partner with companies and suppliers managing state-of-the-art facilities and custom manufacturing technologies to offer to our clients and the markets they serve and operate the very best of available. We offer a number of solutions from crop protection to fisheries, manufactured products, agrochemicals, chemical intermediates and Biotech cutting edge advances as the STD-Microgene, a revolution within the field for coastal and sea-salt affected lands. Many of the world’s largest and best-known food manufacturers rely on ND Pharma & Biotech products and technology designed and engineered for natural preservation and protection of hundreds of essential food ingredients. Our high-quality products, best-performance technologies and innovations in industries from agriculture to food manufacturing and processing are in many of the products consumers use and enjoy every day, from grains and meats to salad oils, yogurt and chocolate, ensuring a better food safety, and trust on. The growing of industries and sectors related to agriculture, farming, livestock and the suppliers of greater sectors within is constantly being challenged to meet growing worldwide demand, produce attractive products, fight diseases, increase performance and profitability in a more secure and sustainable environment. ND Pharma & Biotech has an ever increasing number of quality feed ingredients and other innovations that address these issues giving a complete satisfaction to producers and industries in a supporting role and effort to give value to the sectors and fields where we are operating, both directly or through partners, commercial, industrial, technical and of any other class. Medical Devices and Pharmaceuticals are at our core business. We are allowed to make and produce (by ourselves or thru partnerships) High-Quality GMP-GDP Pharmaceutical products, therapeutics and other technological advances in the pursuit of our vision an mission. (To Make Life Better), and specially our Pharma Division motto; (More Hope for Tomorrow). Price competitiveness, evolutionary chemicals, green chemistry, advanced materials, nature sourcing as natural antioxidants, vegetable-based lipids, specialty ingredients, more sustainable products with enhanced specifications, bio-based content and performance, adaptability to changes within the normative frames and regulations, rise of low-priced imports, and many others are just some of the baseline philosophy under our daily effort and work dedication of excellent service to the industrial sector. Give us the opportunity to talk about your needs and the solutions we may offer to such needs. Consumers, and thus far the industry is looking permanently for new ways to make their lifestyles healthier and better. This means essentially a look for foods, beverages, ingredients, nutrients and supplements that may provide health-enhancing and health-protection properties. ND Pharma & Biotech develops and markets thousand of such kind products, molecules, compounds and mixes to satisfy the unceasing demand for innovation. We are a Chemical company. So we source almost any ingredient, compound, molecule, chemical entity or product (branded and unbranded) you may need or can be found in the world. From our scientific team leaders to the well coordinated network of collaborators, (institutional, academic, research of productive) we foster all necessary actions to provide with the best solution at the better price possible, always. are registered trademarks of ND Pharma & Biotech Co. Ltd. and/or some of its related companies. ​All Trade Marks may not be available everywhere.